Hut based high altitude mountaineering on the 3 highest peaks in Ecuador. Climb the volcanoes Cayembe, Cotopaxi,and Chimborazo. Explore the backroads of the highlands and the fascinating Indian markets. One of the best places for a first time experience of high altitude. Optional visits to the Amazon jungle or Galapagos Islands. A one week climb of Aconcagua in Argentina is a great add-on to this trip for the keen mountaineer who wants to take advantage of the acclimatization gained on these peaks. Price includes all accommodation, meals, huts, transportation, and guide fees. A unique opportunity to climb at high altitude without the hardship of camping and huge packs. This is a hut based mountaineering program climbing three summits in two weeks. You will climb the three highest peaks in Ecuador; Cayembe 5790 meters, Cotopaxi 5897 meters and Chimborazo at 6310 meters. 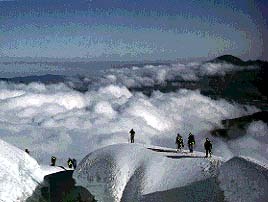 All are intermediate level mountaineering objectives, which require cramponing on moderately steep snow and ice slopes, glacier route finding, and roped travel. Most important is attention to slow acclimatization to these altitudes. Your guide is internationally certified mountain guide Daniel Griffith, with 20 years experience guiding climbers and skiers on 6 continents and 26 countries. His overseas trips include Mount Blanc, Matterhorn, Kilimanjaro, Mount Kenya, Huascaran, Alpamayo, Yerupaja, Aconcagua, Fitzroy, Dhaulagiri and Everest. As member of the Canadian Association of Mountain Guides (ACMG) and the International Mountain Guides Association (UIAGM), Dan is a full time professional dedicated to sharing his love of the mountains with everyone – from beginners to experts. The group meets in Quito where the first day is spent getting acquainted, touring the city and taking a short acclimatization hike. We stay in the classic Hostal Los Alpes and take our meals in the dining room. We then move to Hosteria Cusin, a beautiful Spanish Hacienda near Otavalo, the home of the famous weaving market. Here we have the opportunity to shop for some of the crafts Ecuador is famous for and also to continue our acclimatization with a day hike in the nearby mountains.This is the Ecuador you have dreamed of visiting! Next stop , the climber’s refugio on Cayembe. Here we spend one day hiking and one day climbing to the summit of this impressive summit. We descend and travel to the Hacienda La Cienega near the base of Cotopaxi. Located in the Avenue of the Volcanoes, this 400-year-old mansion is our base for the ascent. On to the Refugio Jose Ribas and next day the summit of Cotopaxi. Now we have a rest day at La Cienega before moving to the Refugio Whymper in preparation for our climb of Chimborazo If we are successful the next day on the peak we move to Banos for a visit to the hot springs and waterfalls or we use this day for another attempt on Chimborazo. We then return to Quito and the Hostal Los Alpes and our homeward flights. This itinerary includes three summits. There is acclimatization time, shopping time, flexibility for weather conditions and time to enjoy the local culture. Please note that weather or climbing conditions may necessitate changes to this itinerary. A complete equipment list will be provided upon booking. All group climbing gear will be provided by the guide. To ensure a space on the trip, please include a deposit of $1000 Cdn. The balance is due 21 days prior to departure. All participants are required to sign a waiver of liability. Please call our toll free number for more information or to clarify details.